There are two full sized pitches available to be used by our club members for training and matches. Both pitches include behind goal nets with the main pitch boasting a covered seating stand, floodlights and dugouts. The pitches are often in demand and are commonly used every year for hosting community games, club GAA games and secondary school games. The pitches are also used by the local National School on a weekly basis to promote physical education. In 2011 an astro turf pitch was added to the facilities of the club. The astro turf pitch includes flood lights and offers a great option to teams training during the winter months. The astro turf is available for rent and is often used by other local clubs in the area. Included within the astro turf pitch boundary are ball walls which are used to improve re action times and ball control. These are also accessible externally on two sides, from the pitch and basketball court, with the walls themselves also featuring targets to aim at. The walking / running track encircles the two pitches on the grounds. It is fully flood lit and offers a safe option to all members during the dark winter months to be able to exercise. 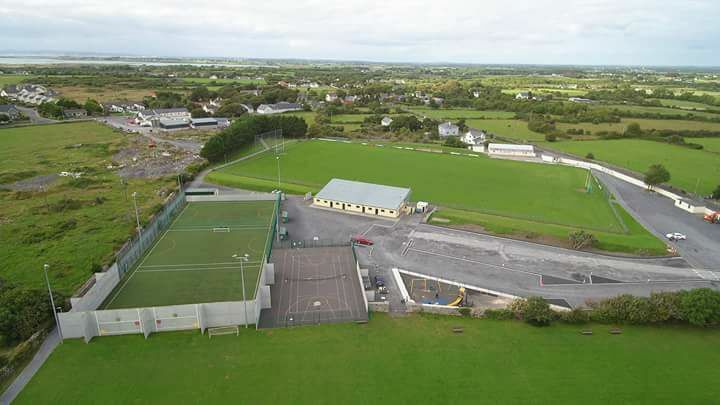 The track is used 365 days a year by all members of the parish and is used by other local groups within the community including the Brothers of Charity and South Galway Athletics club. On the grounds there are other athletic features such as a long jump and plans for a shotput facility in the near future. Ballinderreen GAA club cares about all aspects of play not just sport for our young people of the community. This is why we have provided a playground to encourage that play from an early age. There are swings, a slide, sand play area and lots more to be enjoyed. An outdoor bastetball and tennis court can be found located between the astro turf pitch and the playground. Just another great option of physical exercise that is available to our members. Tá dhá pháirc iomlána ar fáil le húsáid ag baill ár gclub le haghaidh oiliúna agus cluichí. In áireamh ag an dá pháirc tálíontáin taobh thiar de na Cúilí agus seastán le suíocháin agus tuilephointí.. Is minic a bhíonn éileamh ar na páirceanna agus úsáidtear iad go coitianta gach bliain le haghaidh cluichí pobail a rithl, cluichí CLG chlub agus cluichí meánscoile. Úsáidtear na páirceanna freisin ag an Scoil Náisiúnta áitiúil ar bhonn seachtainiúil chun corpoideachas a chur chun cinn. Sa bhliain 2011 cuireadh páirc astro-turf le háiseanna an chlub. Áirítear leis an bpáirc astro, oilse agus cuireann sé rogha iontach ar fáil d’oiliúint foirne i rith míonna an gheimhridh. Tá an t-astrochar ar fáil ar cíos agus is minic a úsáideann clubanna áitiúla eile sa cheantar é.
San áireamh laistigh den teorainn an pháirc astrochar, tá ballaí liathróide a úsáidtear chun feabhas a chur ar thréimhse gníomhaíochta agus ar rialú liathróid. Tá siad seo inrochtana go seachtrach ar dhá thaobh, ón gcúirt pháirc agus ó chúirt cispheile, agus tá na ballaí iad féin a bhfuil spriocanna orthu freisin. Cuimsíonn an rian siúil / reáchtáil an dá pháirce ar na forais. Tá an tuilte go hiomlán ann agus cuireann sé rogha shábháilte ar fáil do na baill go léir le linn míonna an gheimhridh a bheith in ann a fheidhmiú. Úsáideann a lán baill den pharóiste an rian ar 365 lá sa bhliain agus úsáideann grúpaí áitiúla eile sa phobal é lena n-áirítear Club na mBráithre Carthanachta agus Lúthchleasaíocht na Gaillimhe Theas. Ar na forais tá gnéithe eile lúthchleasaithe cosúil le léim fhada agus tá pleananna do shaoráid lámhaigh go luath amach anseo. Bíonn club CLG Ballinderreen i ngleic le gach gné den spraoi ní hamháin don spórt dár ndaoine óga den phobal ach go háirithe. Sin é an fáth a chuirimid clós súgartha ar fáil chun an spraoi sin a spreagadh ó aois aosta. Tá luascadáin, sleamhnán, limistéar spraoi gaineamh agus go leor eile le taitneamh a bhaint as. Is féidir cúirt eitpheil agus leadóige lasmuigh a aimsiú idir an pháirc astrach agus an clós súgartha. Díreach rogha eile eile de chleachtadh coirp atá ar fáil dár mbaill.